Sometimes the Spirit helps me listen to the LORD even when I'm not paying attention. On this Saturday in Rome recovering from jet lag, I answered my HEARTLIGHT and Verse of the Day email. There was a theme in the questions today. What do I do about an alcoholic husband who won't admit his addiction and is ruining his relationship with me and our two young children? When is it okay to drink and when is it destructive? As I opened myself to the LORD so that I could share something more than my own lowly opinion, something important happened. The words I shared were not my own. Even more importantly, the words were not just meant for someone else. I heard them for me. No one can serve two masters. Either you will hate the one and love the other, or you will be devoted to the one and despise the other (Luke 16:13). 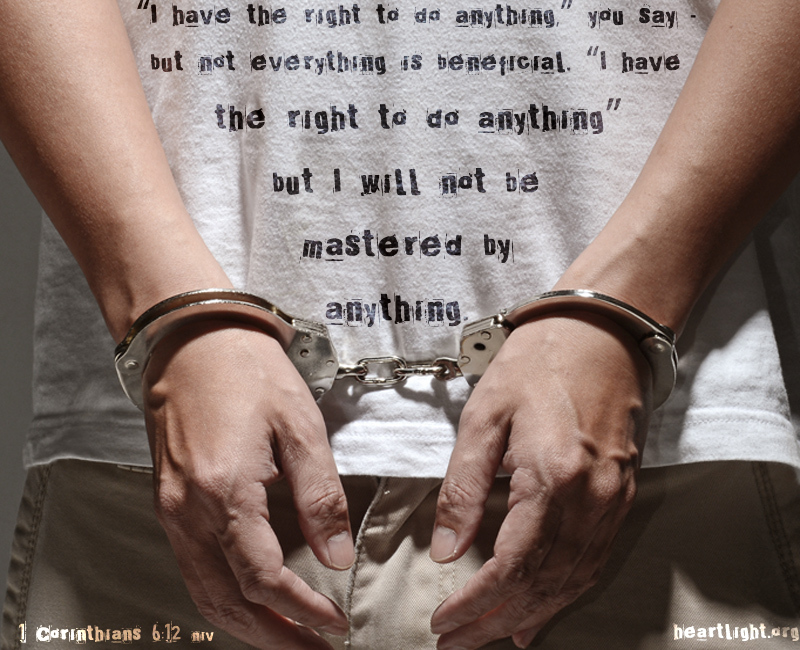 "I have the right to do anything," you say — but not everything is beneficial. "I have the right to do anything" — but I will not be mastered by anything (1 Corinthians 6:12). I shared with my inquirers how we ought to take the sixty-day challenge if there was something that seemed to be a problem in our lives. In other words, we do not use, partake, drink, or purchase what we worry might be a problem for sixty days. Yes, that is extreme. So at first, we might want to fast once per week from that "thing" to see if it is an issue. If we are still not convinced, then we can take the full sixty-day challenge. The point is, we can let almost anything "master us"! The very thing Paul refused to do was let his freedom become his undoing. Like Paul, we don't want to cheapen grace so that it becomes our burden. We don't want our vices to master us and become our idols! So what is it that can master you? It's not fair for me to ask you and not ask myself. This is what I found. For me, one bad habit that can master me is sugar and caffeine combo. In my early years, it came in the form of sweetened iced tea. Now it is Dr. Pepper. I use it for fuel to ignore rest, abandon Sabbath, and keep pushing. Underneath, there is this manic sense that I've got to get everything done, or I'm not worthy. Underneath that, there is an even deeper fear that I've got to accomplish a lot or my life is not worthwhile. Underneath that is a convicting heart-stopper for me: at rock bottom, sometimes I distrust that God can use me to get done what needs to be done while taking a Sabbath rest once per week and living a normal schedule. My fear of insignificance drives my need to abuse my body by pushing past normal limits. Output becomes my idol as I kneel at the altar of ego and significance. To make my situation even more convicting, God has repeatedly shown me that he can take my five loaves and two fish and do incredible things... far more incredible than I can dream or manufacture on my own! So for me, the sixty-day challenge is a must do. So that's my biggie — there are several other not so biggie ones, but that's the real issue for me. What's your issue? What can master you? Yet even as I talk about my issue and challenge you to look at yours, I have to remember that I cannot master what masters me on my own. Self-reliance is another form of denial that just shifts my addictive behaviors to something else. If I am going to get rid of my false master, my idol that displaces the LORD, I won't do it on my own power. Getting rid of my idol will take my commitment for sure; however, I will not accomplish tearing down my idols on my own will-power. That's where the old, beautiful image of Nipper listening to "His Master's Voice"*1 [See Note 1 Below] becomes a great reminder to me. This old image and logo (see image at the top of the page and at the bottom), reminds me that I'm not going to get my life right by only getting rid of things I don't want mastering me! Jesus warned us of this in the parable of the demon in the house (Matthew 12:43-45). I don't just need to rid myself of my idols, I must turn my focus on Jesus. He must be real to me. *2 [See Note 2 Below] I've got to spend time listening to my Master's voice! I have to open myself to be re-mastered by the LORD, not my weaknesses, vices, and insecurities! So whose voice are you listening to? What masters you instead of Jesus? Hmm... important questions that can lead to some scary places. But then, true freedom and real life never come without a price. And that price is a lot less than the messes from which we spend so much time extricating ourselves! So I ask you again. What masters you instead of Jesus? Special Note: Larger image of 1 Corinthians 6:12 can be seen in our Gallery Images. 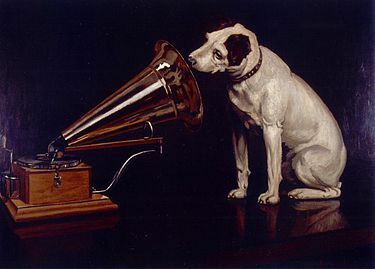 His Master's Voice, abbreviated HMV, is a trademark in the music business and was for many years the name of a large record label. 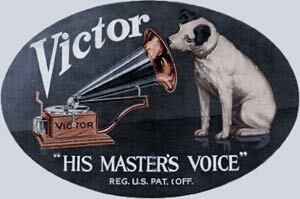 The name was coined in 1899 as the title of a painting of the dog Nipper listening to a wind-up gramophone. In the photograph on which the painting was based, the dog was listening to a phonograph cylinder. What can I do to find Jesus in my life again? Jesus doesn't seem real to me right now, so how can I regain My relationship with Him? I've messed up my life so badly, can I ever find my way back to Jesus? I am honored to remind them of several important truths for baptized believers, disciples of Jesus who have lost their way in following Him as Lord. First, I want to share this most important message. When we are in crisis or can't seem to find Jesus in our lives, we want an immediate fix. Let's remember it took a while to get into the messes in which we find ourselves, or it took some time for our hearts to grow cold to Jesus' presence. It may take a little time to get change and regain that sense of the Lord's intimate presence. However, the Lord will never forsake us or abandon us (Hebrews 13:5; Romans 8:32-39). Sometimes we can lose sight of His presence in our lives because we have not focused upon Him. Therefore, we must not give in to despair. The Lord is near (Philippians 4:5). He longs to be a part of our lives (Revelation 3:20). So let's seek after him and find Him (Acts 17:27). He promises that if we seek Him, we will find Him, and He will be real to us (Matthew 7:7-11). There are two special ways to seek after Jesus that I have found can help us, just as they helped many others who have come before us. SPEND TIME WITH JESUS EACH DAY! Commit to spending time in the 4 Gospels that tell the story of Jesus' life. I like to go in this order: Mark, John, Luke, Matthew. Do this all year. Read one chapter a day from the Gospel. Before you read the chapter, pray something like the following. Father in heaven, I believe in you, but my life is a mess and filled with struggles. I need to know Jesus is there for me. So as I read today, have the Holy Spirit open my mind, my heart, and my will to know what Jesus wants me to know today, what He wants me to feel about what I read, and what He wants me to do. Thank you. In Jesus' name I pray. Then read one chapter. Knowing Jesus is like growing any other relationship, it takes a little time to do it well. So doing this daily is important. Don't rush it. As you read the appropriate chapter, listen for what the Lord Jesus wants you to know from the chapter. There may be several things that are new, but try to hear the primary one thing. Sometimes it is helpful to say out loud, "Lord Jesus, what do you want me to know from what I read today?" It is helpful to have a little journal or use your digital calendar or your notes app in your computer or phone and record this. Then go through the chapter a second time focusing on what Jesus wants you to feel about what you have read. You don't have re-read it word for word, but think through what you have read and write down what you believe Jesus wants you to feel about what you have read. Then think through the message a third time and write down what you believe Jesus wants you to do — what you need to put into practice. This will be harder at first, but soon you will feel more comfortable doing it. On top of that, as you speak with Jesus and listen and wait for those things He is showing you then you will recognize that it is not just you doing the study. He is there and helping you through the Holy Spirit. I believe if you do this over this next year, by the time December comes around you will be amazed at how much more real Jesus is to you. There are 4 ways we can experience Jesus' presence as Immanuel — God with us. Through His story — what the focus of the first response above was talking about. This is getting to know Jesus through His story as it becomes real to us. In authentic spiritual Family — as you share in grit and grace of genuine spiritual family Jesus shows His presence to you (Matthew 18:20 — but read the whole chapter to see what that involves). We were not made to do Christian life alone. We need brothers and sisters in Christ, and as we live in spiritual family caring for each other, Jesus becomes more real to us. This kind of spiritual family experience can be found in a small group, a missional community, a Bible class. But this generally doesn't happen for us by simply attending a big church and remaining anonymous and not connected to a close group of believers. In offering compassionate care to others in Jesus' name — as you care for others in Jesus' name, you can experience His presence as God with us (Matthew 25:40 — again, read the context of these verses). Caring for others, especially those who are in need and cannot repay us, opens our eyes to Jesus' presence in those whom we help. In making disciples — as we step out of our cultural security and go share the message of Jesus with others and help them become Jesus' disciples, Jesus is present with you (Matthew 28:18-20). This is not evangelizing or witnessing, but investing our lives in others so they become followers of Jesus, and he promises to be present. The last three of these areas of experiencing Jesus as Immanuel should be part of any healthy church or missional community. So look for opportunities to live in authentic community, involved in acts of compassion, and be involved in mission trips and maintaining relationships with those who are brought to the Lord through them. The first one is something you can do on your own as part of your daily walk with Jesus. I want to encourage you to use this special season of the year to welcome Jesus into your life again and begin the New Year with a closer walk with the Lord! "Re-Mastered!" by Phil Ware is licensed under a Creative Commons License. Heartlight encourages you to share this material with others in church bulletins, personal emails, and other non-commercial uses. Please see our Usage Guidelines for more information.